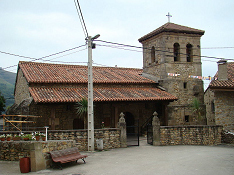 The Parish Church of St. Sebastian in the village of Garabandal, in the Peña Sagra mountain range of Northern Spain is now in the process of renovating its old 17th Century Church. Because it is a historical landmark of significant value and importance for the area, we are turning to you for financial assistance. In fact, without your help, we cannot meet the cost of such an enormous endeavor. The Church is old and in need of desperate repairs. The village is small and poor, numbering about 300 people. Therefore, of itself it cannot manage to pay for it all unless you lend a helping hand. We extend to you our warmest and deepest gratitude for your generosity. Everyone knows how significantly important this quaint little Church is and will be for the many people who are coming and will be coming in the future. May God bless your generous giving! And may you be forever remembered in the prayers and memory of all those who climb up these Cantabrian Mountains to offer fitting praise to the Lord and honor his Virgin Mother Mary in this house of worship.